Students will learn about the shadow plays of Bali and Java. They will learn about the Ramayana, a popular story that is traditionally performed in Wayang Kulit (leather shadow puppets). Students will be assigned a part from a reader’s theater play and create a puppet using cardboard for the character that they have been assigned. Finally, students will perform their own play using their puppets. 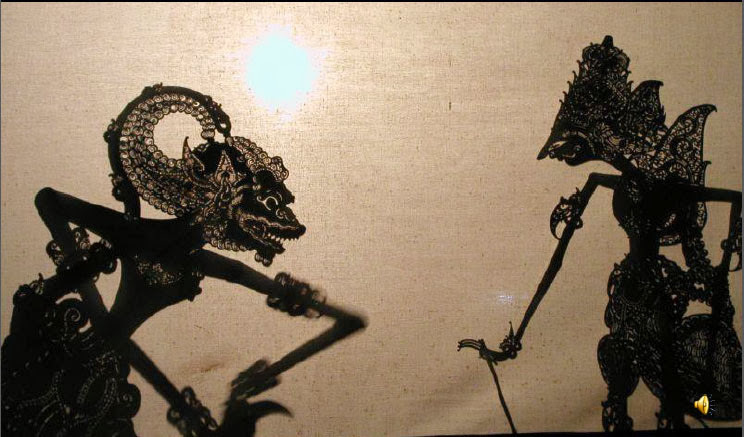 view the introductory presentation about Wayang Kulit. read the book Rama and the Demon King: An Ancient Tale from India or Rama and Sita: A Tale from Ancient Java. The illustrations in Rama and Sita are excellent examples of Wayang Kulit, but the text is a little high for grade three. Rama and the Demon King is clear, accessible and brief. Sometimes I show the illustrations from Rama and Sita and read the text from Rama and the Demon King. Assign students a part from a Reader’s Theater Play. Design the puppet in a sketchbook. I have found that it works best to have students only have a moving arm that is articulated at the shoulder and the elbow. Many students want to have a wagging tail or a moving mouth, but if you have a large class size (like I do) it can be difficult to coach the students to make parts for these ideas that are large enough to put a paper fastener through without ripping the puppet. Model a few designs on the board and show how to make a face in profile. Draw the puppet on a piece of cardboard and color with Gel Effects Markers. Paint on highlights with gold tempera paint. Cut out the puppet and assemble using a screw punch, cutting mat and paper fasteners. Atatch a wire to the body and a wire to the hand so the puppeteer can move the puppet. Perform your puppet show with a sheet hung up in front of an overhead projector. This entry was posted in Lesson Plans, Making Puppets and tagged art, Bali, education, Indonesia, lesson plan, puppets, shadow puppets, Wayang Kulit. Bookmark the permalink.